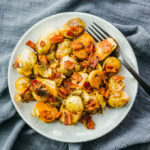 A low carb recipe for Instant Pot brussels sprouts with bacon, apple cider vinegar, and soy sauce. Select the saute mode on the pressure cooker for medium heat. When the display reads HOT, add chopped bacon and cook for about 5 minutes until crispy, stirring frequently. Turn off the saute mode. Add brussels sprouts, soy sauce, vinegar, salt, and pepper. Stir to mix well, using a wooden spoon to briefly scrape up any brown bits stuck to the bottom of the pot. Secure and seal the lid. Cook at high pressure for 4 minutes, followed by a manual pressure release. Use a slotted spoon to scoop up the brussels sprouts and bacon onto a serving plate. This recipe yields 6 g net carbs per serving.